The Costa Daurada is a holiday destination to rival anywhere else in the world, with a mix of culture, beaches, nature, history and plenty of things to do. This area runs along the south of the Catalan coast in the province of Tarragona and, compared to the Costa Brava in the province of Girona further in the north, it is far smoother and its golden sandy beaches stretch for miles as opposed to the smaller, intimate coves of the Costa Brava. Situated about an hour’s drive south of Barcelona, this stretch of Mediterranean coastline has been a family favourite for years with its quality beaches, child-friendly things to do and the world-class theme park Port Aventura in Salou, which boasts a wealth of thrill-rides, roller-coasters and quality entertainment. The name Costa Daurada, ‘Golden Coast’, pays homage to its beautiful sandy beaches. 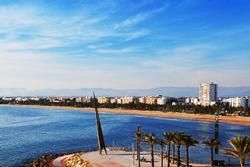 These sun-kissed Mediterranean shores have a wealth of popular beaches, such as Platja Llevant, La Pineda or Capellans in Salou, which get very busy in the summer and are bustling throughout the day and night. For more tranquillity the quieter fishing town of Cambrils is ideal for relaxing and sunbathing, as are the towns closer to the Ebro Delta, such as l’Ametlla de Mar, Amposta, l’Ampolla, Sant Carles de la Ràpita or Tortosa, all boasting a vast array of historical features. Nature lovers can enjoy a boat trip along the marshes and lagoons of the Ebro Delta, 320 km2 of sandy delta, the biggest wetland in Catalonia and one of the most important aquatic habitats in Spain. If you are also interested in the culture and history of this area, we suggest you go for a stroll in the old town of Torredembarra or take a look at the castles of Creixell, Calafell and Tamarit, dating back to the Middle Ages. 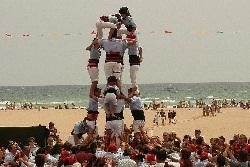 Much like the rest of Catalonia, the Costa Daurada hosts a great deal of distinguishing traditions and cultural customs. In fact, every single town celebrates in summer its Festa Major or Summer Fest, a chance to let your hair down and celebrate as the locals do! 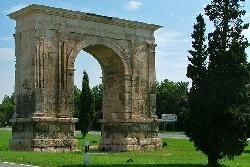 Take a step back in time and visit the Roman triumphal arch in Roda de Barà, once welcoming travellers arriving in Tarraco, the old roman name for Tarragona. 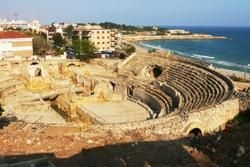 Why not head out to Tarragona for a taste of history? Dating back to around III BC, Tarragona houses a wealth of archaeological remains and its ruins have been designated as a World Heritage Site by the UNESCO. It is generally considered as one of the most interesting places in Catalonia and the amphitheatre, the circus and the city wall have been well preserved over the years. The inland area of the Costa Daurada is also worth a visit because of its beautiful landscape full of forests, rivers and wine-making region, El Priorat. This area boasts many outdoor activities and is also an area of cultural interest. Take a modernism tour starting in Reus or the Cistercian route to the restful and peaceful monasteries of Poblet and Santes Creus. Worth a stop is Montblanc, an impressive medieval walled town with many examples of Romanesque, Gothic and of course Modernist architecture. 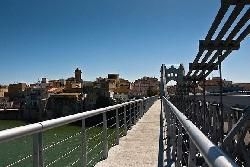 And don't forget Valls, which traditions and gastronomy will surprise you. The whole of this area is very well connected to Barcelona by train, but is equally reachable by car along the N-340 road or the AP7 motorway. In short, the beautiful coast of the Costa Daurada is alive with top-class beaches, intriguing quaint villages, bustling resorts, fun-parks, history and culture. When you add all of this up and marry it with the nightlife, excellent accommodation options, fabulous restaurants and friendly locals, the Costa Daurada proves to be a resort which makes people come back year after year!